This course is offered at the graduate level for 4 credits (4ECTS) through KU Leuven or you may audit the course (no exames, no credit). A facility with the forms of the subjunctive and an awareness of its uses is presumed of participants in this course. Dates: 11-22 August 2014. Classes are held daily from Monday 11 August for two weeks until Friday 22 August (not Saturday – Sunday 16 – 17 August). Enrol for the first week or for both weeks. 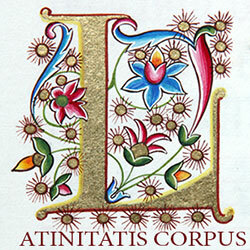 Hours: Instruction in liturgical Latin is given every afternoon from 14:30 – 17:30. Enrol: More information will be available on this web-site at BSAC where updates will appear in due course. Tutor: Daniel McCarthy first studied with Reginald Foster in 1999 in Rome and continued while earning a doctorate in sacred liturgy (more here). Their collaboration has developed to include several publications. 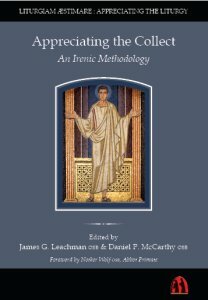 Their first publication of Foster’s method is available as the chapter: “Collectarum Latinitas”, in Appreciating the Collect: An Irenic Methodology, ed. J.G. Leachman – D.P. McCarthy (Documenta rerum ecclesiasticarum instaurata, Liturgiam aestimare: Appreciating the Liturgy 1), St. Michael’s Abbey Press, Farnborough 2008 (available here). They have also collaborated in publishing their renderings of Latin prayers in clear English. These were appeared in the weekly column, Listen to the Word published in The Tablet of London from 18 march 2006 – 26 November 2011 (full list here; organized by Sundays here). The commentaries on the opening prayers were collected in the following volume: Listen to the Word: Commentaries on Selected Opening Prayers of Sundays and Feasts with Sample Homilies. Revised from articles that appeared in The Tablet 18 march 2006 – 15 September 2007, augmented with five Homilies, The Tablet Publishing, London 2009 (available here). They also collaborated on the English renderings of the Latin texts of the Easter vigil in: Transition in the Easter vigil, Becoming Christians: Paschali in vigilia Christiani nominis fieri, ed. D.P. McCarthy – J.G. Leachman (Documenta rerum ecclesiasticarum instaurata, Liturgiam aestimare: Appreciating the Liturgy 1), St. Michael’s Abbey Press, Farnborough forthcoming, 27-56. LEWIS, C.T., – C . SHORT, A Latin Dictionary, Oxford UP, Oxford – New York 1879, reprinted 1995. GILDERSLEEVE, B.L, – G. LODGE, Gildersleeve’s Latin Grammar, Bolchazy-Carducci, Wauconda IL 2003, reprint of 31895. More information on travel to BSAC by air, train or metro and on accommodation at or near Ealing Abbey is available on the web-site of the Liturgy Institute under the button: “Courses Summer 2014”. There you can also find the procedure for enrolling in non-credit courses at BSAC (IL enquiry form and enrolment form here) and for enrolling in graduate credit courses accredited by KU Leuven and taught at BSAC (KU Leuven enrolment information here).